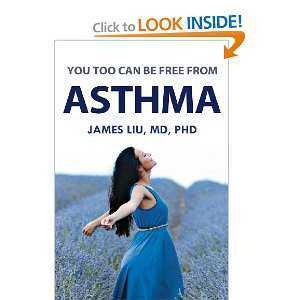 In a new book entitled, You Too Can Be Free From Asthma (Amazon.com), Dr. James explains why the asthma is preventable rather than just using an inhale to reduce asthma symptoms. Dr. Liu and his research team have spent countless hours in developing a safe and cost-effective approach to help people whom suffer from the asthma. Most people know there is no drug for curing or preventing asthma. Simply, there are too many environmental factors and the body’s unique sensitivity towards these outside factors which cause the asthma hard to cure. New medical researches gradually lead the way to better manage asthma. In the book, Dr. Liu listed these common asthma triggers stored in the nose, and how to use a simple, safe and cost-effective method to remove these asthma triggers. Although asthma patients are very sensitive to these asthma triggers, it is still a dose-response phenomenon. It takes time to inhale enough pollen particles, for example, before an asthma flare up. If you can practice a complete nasal cleanse, these inhaled triggers cannot reach that high concentration. Therefore, you can control how often you can perform this practice, and win the battle. In the USA, about 26 million asthma patients are suffering from this disease. Sick kids just cannot go to school, and adults lose productivity because the asthma causes you non-functional. This book provides the information and characteristics of DrHealing AsthmaCare Kit (www.nasalcleanse.com), a unique product packed with a winner of the “Best New Product” Award for treating cough, cold and allergy, along with a homeopathic spray with 23 active ingredients. This kit helps you do both: the first is to remove these asthma triggers, and the second is to reduce the severity of the asthma symptoms. TechWorld Medicals, Inc. is an organization engaged in the research, development and manufacture of medical devices, OTC drugs, and dietary supplements. For more information about NasalCare® products, please visit www.nasalcleanse.com. James Liu, MD, PhD, Chief Executive Officer of TechWorld Medicals, Inc.
source: / PRBuzz / January 4, 2013.